We are still battling against the wind! Today we tried to sneak up an inlet today that, according to our charts, would have allowed us to make progress in the lee of some high ground. Unfortunately the charts were not correct and after six hours of pushing and pulling we ended up 930 precious meters ahead of where we started! The bottom line is that rowing into a 30kt wind with our boat is not only impossible but also very dangerous as the sea has become really nasty. We are currently tucked in behind a pingo, a common feature of the landscape up here, which is a small hill or bump that is perfect to hide behind. We have lots of days ahead of us to make up the lost time and we have planned for these delays so it’s all good. We can’t complete this journey in a few days but if we’re not careful, we could certainly end it. For now, we are waiting for the conditions to improve so we can get moving again. We will be ready for a big push when the low pressure moves on. We have always agreed that we would be cautious with our approach and for now we have made all the right decisions. 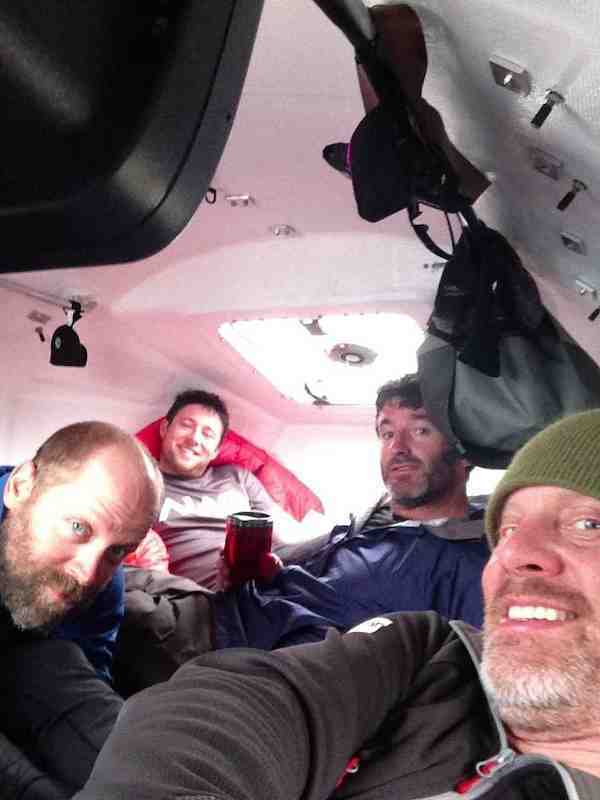 We are happy, warm and safe, getting to know the boat and all our equipment. A few years ago, I was given a tile with a quote that said “the difficult we do immediately, the impossible takes a little longer”. I was reminded of this earlier today as we attempted to haul the boat through the shallow choppy water. It’s only day 4 but already we know we’re up against it. Tuktoyaktuk (Tuk) is a small community up here that sits about 180 km North East of our starting point – Inuvik. We were hoping to hit Tuk in 2 to 3 days. Right now we’ve taken shelter in a little inlet as we cannot row into the 25 knot wind that has taken an annoying shine to us. Yesterday morning we came to a halt due to similar conditions so we had to sit out the afternoon and the evening. We got going again this morning in choppy swell but the wind picked up over the course of the morning, which stopped us dead in our tracks again. Another interesting aspect that makes progress very difficult is the depth of the water. 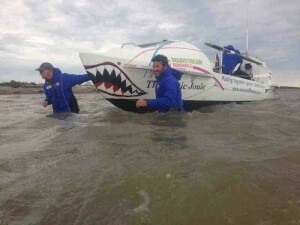 It’s very shallow (2 ft) in parts which makes forward progress in a 2,300 lbs rowing boat extremely difficult. We all knew as Van Morrison put it “there’d be days like this” but if I’m being honest, I supposed we’d hoped that we would have been further into the trip before getting stopped by the weather. Given that forward progress was not possible by rowing, we pushed the boat along the shore line with our feet sinking at times above our ankles in the soft mud. We did this until it was no longer possible. So we’ve taken shelter again, we’re about 7km from Tuk and for now this is where we must sit and simply wait for better conditions. Things change quickly in the arctic. Paul and I finished our midnight shift with Stan’s Northwest Passage still in our minds and handed the oars to Frank and Denis. Time for a little shut-eye after cooking, eating, writing and fixing essentials. Busy times on the boat. We’re not asleep for long when the heaving and slamming of the boat rouses us from our slumber. I glance through the cabin door to see Frank and Denis rowing intently, faces stern, tempo high. The sea is steep and choppy and the wind is bearing down on us with intent. It’s a far cry than the calm we were experiencing just a few hours ago. When Paul and I take our turn again at the oars forward movement is all but halted. It takes us 90 minutes of rowing in position to realize that our efforts are fruitless. We take refuge in a small bay on the coast and wait for things to change. We’re in the game now. It’s noon on Friday July 5th and we do what we’ve been planning to do for the last year and a half: we start our journey across the Northwest Passage. Emotions swim in my head as we begin rowing down the mighty Mackenzie River. The obvious elation in realizing a dream is tempered by the reality that this dream will entail lots of hardship and effort. The fact that it’s been an abnormally robust ice year – in recent years – weighs heavily as well. We know if we succeed under such circumstance our expedition will speak to the reality of climate change even louder still. But before long heavy thoughts give way to the majesty of the environment as we snake our way down the murky brown waters of the Mackenzie, its green walls seemingly impenetrable in their thickness. We’ve immediately fallen into rowing shifts of 4 hours on and off with Paul and I starting things out. By the end of the first 4 hour effort my body screams to the fact that I’ve been spending far too much time planning for this expedition than training for it. 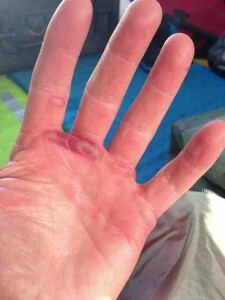 My hands are blistered and my backside sore. By noon on the 6th we’ve rowed continuously for the past 24 hours with each team of two having rowed 12 hours each. It’s been tiring work but the effort has brought us to the mouth of the Mackenzie opening onto Kugmallit Bay and the Beaufort Sea. 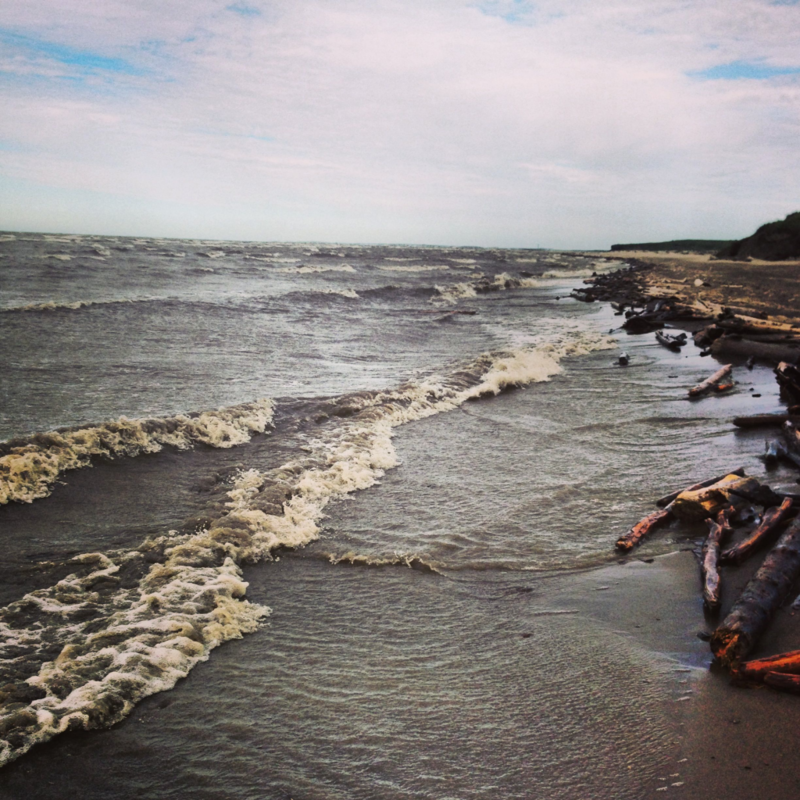 The Mackenzie carries mountains of silt in its waters and deposits much of its load in the delta. Navigation can be very tricky through these murky waters as sand bars lurk everywhere – much of the delta, hundreds of square kilometres in area, is less than 4 feet deep. Our magic number is roughly 2 feet – anything less we’re grounded. And grounded we were, countless times. It got so bad on one occasion that we had to get out and haul The Arctic Joule across a seemingly endless sandbar. It would take us hours to negotiate the delta but by 1:00 am Sunday morning the sun shined brightly over a calm sea and we were moving up the coast to Tuktoyaktuk, some 60kms to the Northeast. The drive from Vancouver to Inuvik is just shy of the distance from Vancouver to Toronto. It’s a 4000km straight shot north – exactly 4000km in fact as we drove one lap around Inuvik on our arrival to ensure we reached the magic number – and is a journey I’d encourage any adventure seeking soul to do once in their lives. The shear length of the trip is a sobering reminder of the vastness of our country and makes one realize that there’s a lot more to Canada that what’s strung along the 49th parallel. Our route travels from Vancouver up Highway 1 through mountains and forest to the city of Prince George, right smack in the centre of British Columbia. From here it’s northwards on the Alaskan Highway to Fort Nelson – a remote, wild section of road affording large critter sightings from bear to buffalo to moose seemingly around every bend – and onto Whitehorse, Yukon the ‘big city’ gateway to the mighty Yukon River. Pushing ever northwards our route takes us into gold rush history as we pay a visit Dawson City, YK and the terminus of our blacktop. 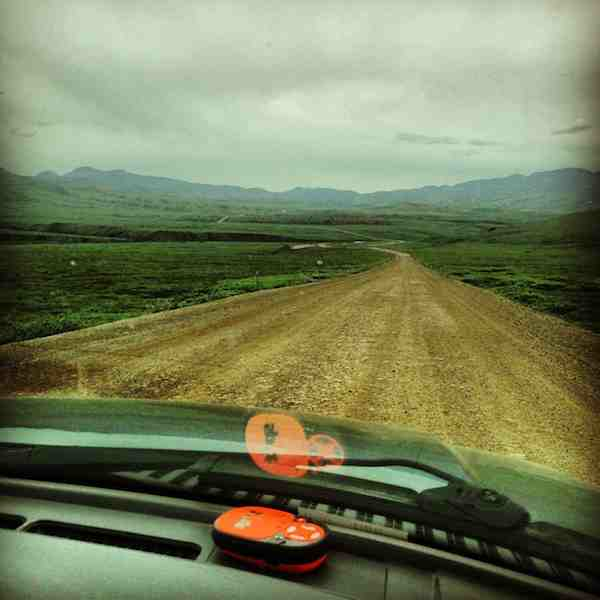 Just a few kilometres shy of the tiny Klondike community is the start of the infamous Dempster Highway, a 750 km tire eating, vehicle destroying gravel and slate road road that boldly pushes northwards through the the mountains and wilderness of the Canadian north. It’s just after halfway that our location final hits home as we pass a sign stating you’ve now crossed the arctic circle. The Dempster is long, remote and can be downright nasty when it wants. We’re told our single flat tire and punctured power steering column was the road letting us off easy. Inuvik is cool and windy making us keenly aware that we’ve arrived, that we’ve arrived in the arctic. Recently a lot of friends and family have asked us if we’re looking forward to starting the expedition. We haven’t really had time to think about it – there’s simply been too much to do. The perception some might have is that we are four madmen heading off on a wild adventure. The reality is actually quite different, yes there is obviously an element of adventure but for all four of us, there is an enormous amount of meticulous planning that has to be done to just get to the start line. The past 6 weeks have been very busy on this front. I was in London and Jersey for some speaking engagements in early June, then back to Ireland to see my family, attend a friend’s wedding and do some work with our expedition sponsor Mainstream Renewable Power. All the while trying to get a million things done back in Canada before our departure. I feel so fortunate to be part of such an amazing team of people doing this expedition. Kevin has been brilliant in getting all of our communication systems set up and liaising with various people and organizations who are helping us with our weather planning. Our communication system is very important as it will enable us to receive forecasts from the Canadian Ice Service. Our system which includes 2 Satellite phones, 1 laptop and an i pad as back up will also allow us to share all aspects of this trip with the outside world over the next 2 to 3 months. Denis has played an absolute blinder in getting all the finishing touches done on the boat. The final 10% here is so critical as it really does involve a tremendous amount of fine tuning. We have spent a number of weeks altering our rowing set up to try and make it as efficient and as ergonomic as possible. We’ve also added in a back up steering system as well as another solar panel to power our batteries on board. We decided to bring two batteries instead of one which gives us the ability to run our charging system off either battery. Although this means a little extra weight, we felt it more important to prioritize safety over weight. This is a balancing act with everything we have on board, the more weight we have, the heavier the boat is to pull. For example our life raft weighs 135 lbs, that’s a huge amount of additional weight for something we hope to never use but going without one wasn’t an option……better to be looking at it then looking for it!! Frank has been looking after all the food supplies, equipment, clothing and as an experienced film maker has taken care of everything on that side of things as we’re making a documentary so he has been fantastic too. Amongst our food supply is 960 freeze dried meals, 700 power and chocolate bars, 600 tea bags and a few bottles of good single malt. So the lads have been very busy over the past few weeks, come to think of it I’m not entirely sure what I’ve been doing but whatever it is time as flown. Training has taken a back seat for the past 2 weeks, we’re not too fused about this as we’ll each be rowing 12 hours a day for the next 2 to 3 months so having a break from training right now is not exactly a bad thing. The first leg of this journey has now begun, we’re driving our boat 3,700km from Vancouver to our starting point at Inuvik. 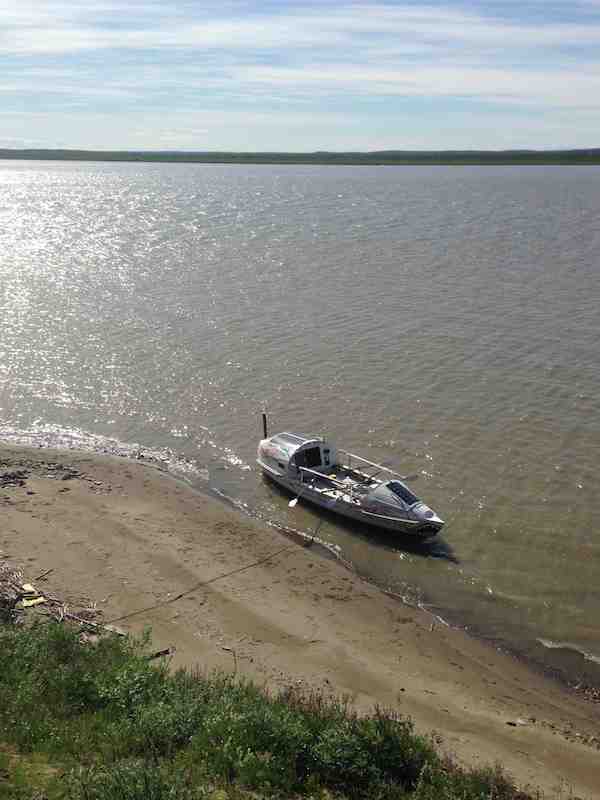 We shrink wrapped the boat to protect it as 750km of the drive is on the Dempster Highway which isn’t a paved road. We’ve packed multiple spare wheels for both the truck and the boat trailer as we expect to blow a few along the way. I’m writing this from the back seat of our truck, we’ve just crossed into the Yukon Teritory so we’ve done about 2,000km so far. The landscape up here is incredible and already today we’ve been greeted on our way by Black Bears, Moose and Buffalo. It’s 26 degrees out, CCR are banging out the tunes, Frank is driving, Denis is sleeping and Kevin is taking some photos. So the scene is set for what will be one of the most difficult things I have ever done in my life. It’s not necessarily the physical challenge that makes this so difficult but more the cloud of uncertainty that Mother Nature will cast over us on this expedition. We can prepare and train all we like but ultimately she will decide if we make it across the North West Passage or not. How this all plays out we don’t know but I suppose there in lies part of the attraction in attempting something like this. There’s an expression I read many years ago that comes to mind at this moment – “If you wait till your sure, you’ll never do anything……are we sure we’ll pull this off, absolutely not but there’s only one way to find out.